Ariel is a princess that many of us can relate to. She simply wanted to go out and see the rest of the world beyond Atlantica, but her overprotective father wouldn't let her have an adventure! Well, we want to see everyone's little girl get her own chance to go on a fairy tale adventure and what better way to get things started than dressing her up like the beloved Disney Princess? This Ariel Ultra Prestige Wig is a perfect start! Based on the classic animated film, The Little Mermaid, this child wig recreates the flowing red locks of the cartoon character. 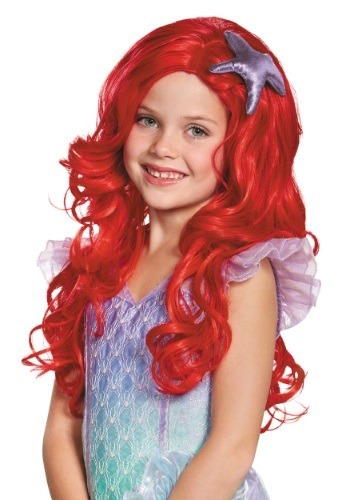 The wig is made of bright red synthetic fibers, so all your child has to do to step into the role of Ariel, is slip it on her head. Your little girl will be ready to step outside of Atlantica to see what there is to discover. Of course, you might want to teach her to stay away from nefarious sea witches like Ursula before you send her out on an adventure this Halloween!